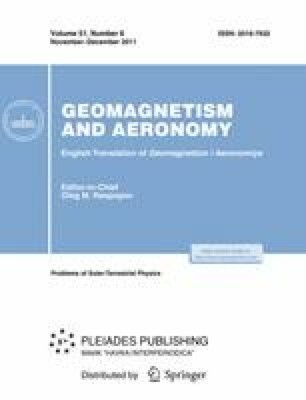 During magnetic storms (MS’s) in the ionospheric D region, changes in the electron density and corresponding effects on radiowave propagation are observed. The differences in manifestations of MS’s in the lower ionosphere are mainly caused by the time and spatial differences in precipitations of energetic electrons. It is shown that the observed differences in the effects of storms in the D region are related to the differences in the corresponding types of MS’s determined by the observed fluxes of energetic electrons (E ∼ 0.1–2 MeV) at L ≈ 3–8. The storm types are identified by changes in the geomagnetic ap and AE indices and the ap/Dst and AE/Dst ratios during the recovery phase of a storm. Original Russian Text © S.N. Sokolov, 2011, published in Geomagnetizm i Aeronomiya, 2011, Vol. 51, No. 6, pp. 757–768.